It’s weird but I realized that I have never actually made cupcakes. I’ve always been a brownie type of girl. I keep seeing such cute cupcakes on Pinterest though so I thought it was time I gave it a try, and with Mother’s Day this weekend I had a perfect excuse. I went and got all of the supplies after work, starting with Hobby Lobby. If I was going to make cupcakes then I was going all out and getting a frosting bag and tip, none of that smear your frosting on top business (no offense). After I got the decorating supplies I went to the store to get the mix and frosting. Now I have been known to make excellent brownies, but ever since I moved out I’ve been burning them, and everything. I couldn’t figure out what was wrong until my roomie realized that we were used to cooking with an electric oven at our parents’ and now we have gas. It cooks a lot faster! With this in mind I bought two boxes of mix in anticipation of burning the first batch. I mixed everything and my roomie helped me pour the mix in the cups. The directions said 14-19 minutes so I started off with 10. 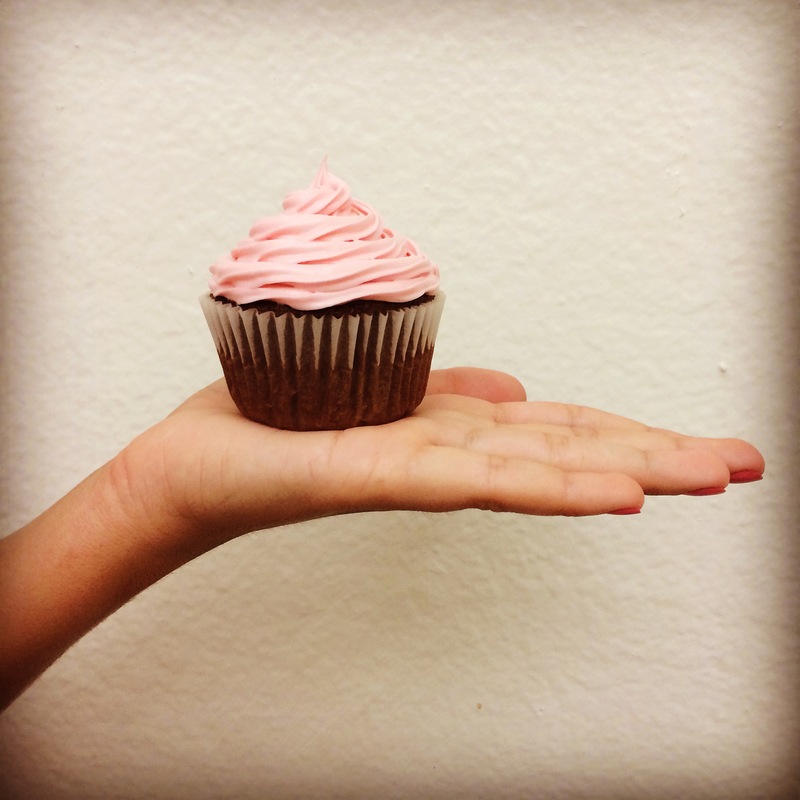 While they baked I turned my white frosting into the perfect shade of pink with a few drops of red food coloring. I impressed myself. 10 minutes was up and I checked the cupcakes, they needed a couple more minutes. After that they were perfect. Wait, did I just bake without burning?! I believe I did! Frosting was what I was really looking forward to. My roomie helped me fill the bag and I went to work. It was a little harder than I thought but I got the hang of it. Who would have thought I would be good at cupcakes?! I saw a cute thing on Pinterest to “gift” a cupcake in an upside down jar so that’s what we did. 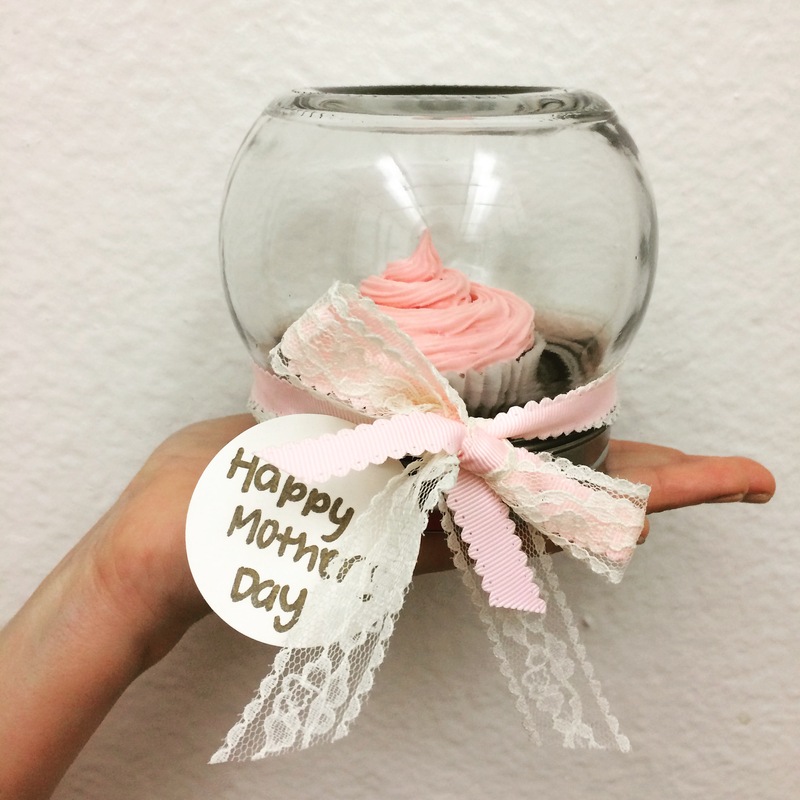 We made Mother’s Day cupcake gifts and they turned out super cute! Next time I’ll make bigger cupcakes though but here is the finished product! Next What’s in the Water?